The allure of a hobbyist server running the "official" version of the legendary Solaris operating system has been growing stronger while I have been playing with openindiana open-source community-driven illumos distribution for a couple of years now primarily as a central storage server for devices across our home networks to share files, and secondarily for having fun with a true Solaris derived environment. 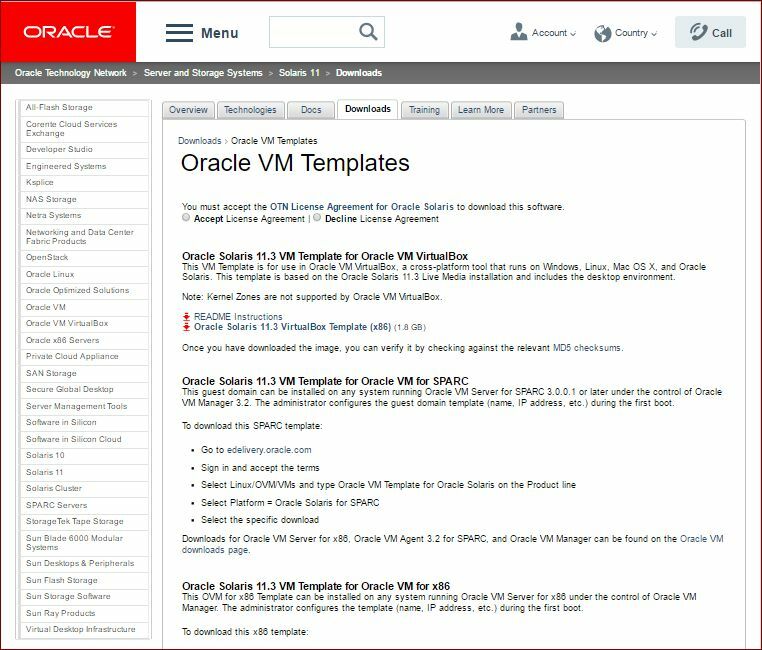 Oracle, the current owners of Solaris, seem to be allowing hobbyist installations of authentic Solaris perfectly legally for non-commercial non-production deployment ("evaluation") via free Oracle Technology Network (OTN) memberships. Best of all, Oracle provide downloads of pre-built and configured Oracle Solaris 11.3 VirtualBox VMs based on the Solaris 11.3 live installation media ready to install and configure, including a complete gnome-derived graphical desktop environment. I finally gave in to temptation and went ahead to download Oracle Solaris 11.3 VM Template for Oracle VM VirtualBox to give official Solaris 11.3 a spin. The download extracts to a 1.83 GB sol-11_3-vbox.ova file that is readily imported by Oracle VirtualBox and boots neatly to an awesome Solaris 11 desktop. 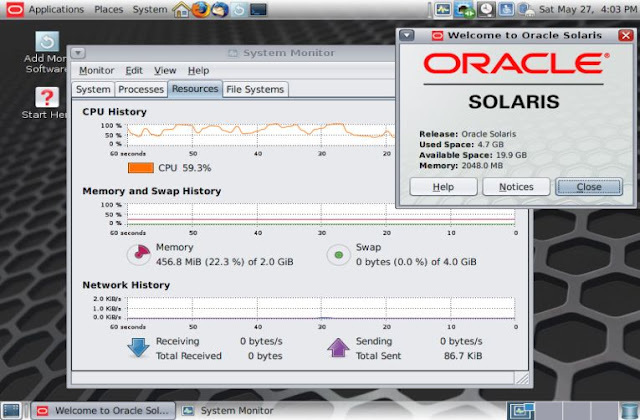 There is no need to sign up with OTN to download the Solaris 11 VM. However, I did sign up with OTN to access pkg-register.oracle.com to obtain for free a key file "pkg.oracle.com.key.pem"and certificate "pkg.oracle.com.certificate.pem" that enabled access to the repositories "Oracle Developer Studio Tools and Oracle Solaris Studio Release" and "Oracle Solaris Cluster 4". 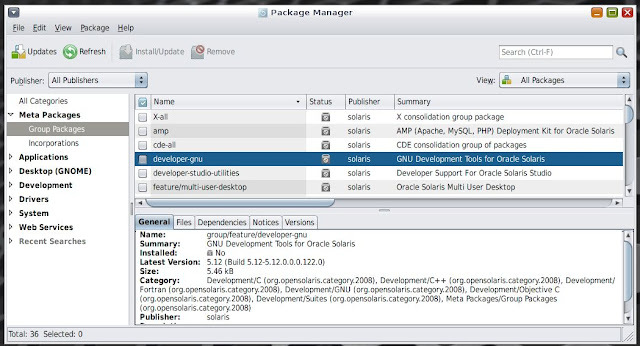 The package manager will now list additional repositories solarisstudio and ha-cluster. Subequent pkg update commands include these additional repositories. However, at the end of the day, I did not install any of the packages made available to me now via the "Oracle Developer Studio Tools and Oracle Solaris Studio Release" and "Oracle Solaris Cluster 4" repositories because a complete suite of GNU C, C++ and FORTRAN development tools is included with the release in the default "solaris" repository and I am far more familiar with gcc than Solaris compilers. In fact, it appears Oracle has included a great set of "FOSS" (Free and Open Source Software) for evaluation with this Solaris 11.3 release, with a goal of formalizing the FOSS collection into the upcoming release of Solaris 12. Here is more information on selected FOSS evaluation packages for Oracle Solaris. I always harden my operating systems before deployment, and found some tips on basic hardening of the already-very-secure Solaris 11 operating system at Oracle's Official Guide as well as documented experiences of others. The following are the Solaris hardening steps I performed. At the least, I disabled the sendmail-related services because I will configure postfix later as my email transport service, and also disabled services related to rpc and nfs; there are surely many other services in the list above that we can disable for a hobbyist installation later. We then harden the ssh daemon that is perhaps the most frequently used service for logging into the Solaris server from other internet or intranet hosts. Here is the /etc/ssh/sshd_config file I use for ssh server configuration. It incorporates many tips about securing ssh, as you can see in the comments. You can probably use this file straightaway as-is. You should also put some sort of notice in /etc/issue file that is presented as a Banner to ssh login users during the login process. In addition, you should also put something appropriate in the /etc/motd file that is presented to the user by the system scripts that run automatically after login. Oracle provides some nice examples and more details about these files here. Enable additional audit logging of privileged actions. Replace <admin-user> with the non-root username you created while installing Solaris (as you know, root is a role in Solaris, not a username). UX: usermod: <admin-user> is currently logged in, some changes may not take effect until next login. You should have a reasonably secure Solaris 11.3 server at this point, good enough to handle an internet-facing network. As a purely personal preference, I do not like operating system enforcement of secure password rules. Problems with weak passwords are always due to human stupidity, and we should not call on machines to compensate. Solaris 11.3 default password rules require at least one numeric digit. I relaxed this rule by editing the file /etc/default/passwd to explicitly specify MINNONALPHA=0 instead of the commented-out default of #MINNONALPHA=1 and tested this change by using the passwd command to temporarily set both the user and root passwords to not contain any digits before setting them back to strong secure passwords. I run a Pandora FMS server to monitor the various networks in my home and on the internet. The Pandora FMS server is configured with Recon tasks that auto-discover hosts on the networks, and SNMP is then used extensively to poll the hosts. In general, an SNMP agent running on any host is often useful in quick monitoring or troubleshooting tasks. The Solaris 11.3 gnome desktop environment conveniently comes with a shortcut "Add More Software" which launches the Package Manager. 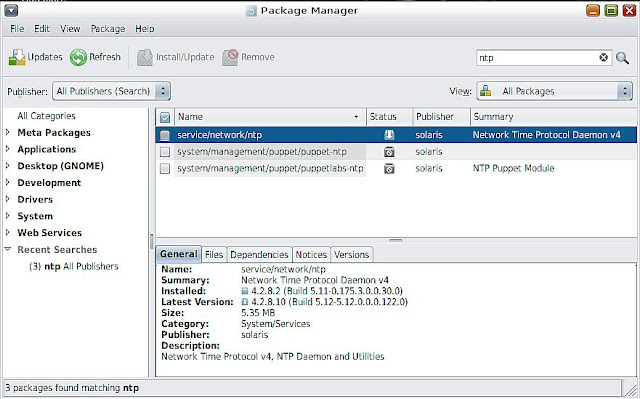 Not knowing what, if any, SNMP package was already installed, I launched the Package Manager and typed in "SNMP" in the search box. To my pleasant surprise, Net-SNMP agent files and libraries which I am quite familiar with from the Linux world along with Fault Management SNMP agent plugins and MIB and SNMP Notification daemon for system events were already installed. I just had to configure and start the Net-SNMP service up. The Net-SNMP configuration files on Solaris 11 reside in the directory /etc/net-snmp/snmp. I backed up and changed the main configuration file /etc/net-snmp/snmp/snmpd.conf to have the following very simple configuration, where mycommunitystring stands for the actual community string needed to access this agent securely. 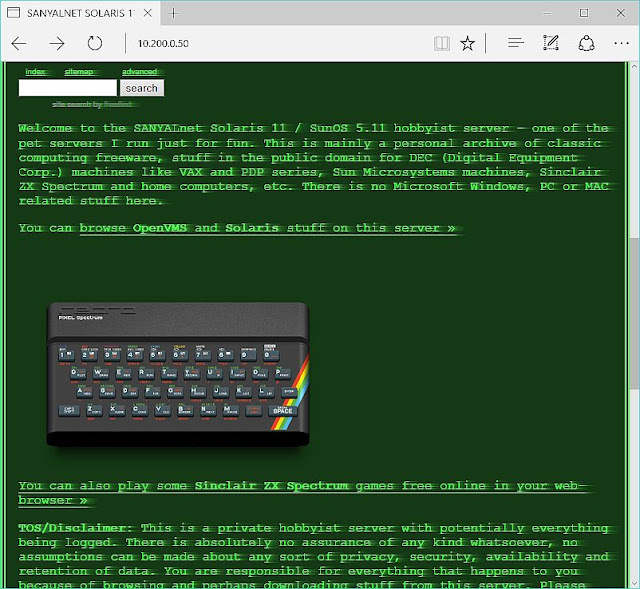 HOST-RESOURCES-MIB::hrSWRunParameters.679 = STRING: "-g -d /dev/console -l console -m ldterm,ttcompat -h -p solaris"
HOST-RESOURCES-MIB::hrSWRunParameters.739 = STRING: "-g -d /dev/vt/6 -l console -m ldterm,ttcompat -h -p solaris11-"
HOST-RESOURCES-MIB::hrSWRunParameters.741 = STRING: "-g -d /dev/vt/2 -l console -m ldterm,ttcompat -h -p solaris11-"
HOST-RESOURCES-MIB::hrSWRunParameters.751 = STRING: "-g -d /dev/vt/3 -l console -m ldterm,ttcompat -h -p solaris11-"
HOST-RESOURCES-MIB::hrSWRunParameters.752 = STRING: "-g -d /dev/vt/5 -l console -m ldterm,ttcompat -h -p solaris11-"
HOST-RESOURCES-MIB::hrSWRunParameters.753 = STRING: "-g -d /dev/vt/4 -l console -m ldterm,ttcompat -h -p solaris11-"
HOST-RESOURCES-MIB::hrSWRunParameters.1205 = STRING: "-Djava.security.policy=/usr/share/vpanels/java.policy com.oracle.solaris.v"
I run a central syslog server on a VPS in the cloud where I send the system logs from all of my servers. I use the stunnel secure-tunnel utility to forward log entries securely over the internet as described in this post. The configuration file for syslog daemon on Solaris 11.3 is /etc/syslog.conf. I edited the file to enable forwarding of system log entries to the local LAN endpoint server for the stunnel (10.42.2.1) which forwards them in turn securely to the remote VPS central syslog server. I also adjusted entries for the auth facility to log authorization failures suitably for use with the fail2ban tool that I have discussed in detail in this post. Here is my complete syslog.conf file. Important: The delimiters in the middle of the lines have to be TAB characters, SPACEs do not work! # Copyright (c) 1991, 2014, Oracle and/or its affiliates. All rights reserved. # - White space delimiter has to be TABs for this to work; SPACEs do not work! A quick check against the Solaris 11 package manager again reveals good news - a NTP v4 daemon is already installed. I just have to configure it to be able to keep the Solaris clock synchronized. The Solaris 11 NTP configuration file is /etc/inet/ntp.conf. The initial installation includes two templates in that directory: /etc/inet/ntp.client and /etc/inet/ntp.server,the intent being one of them can be used as the starting point of the final ntp.conf file. But, I already have a fully functional Solaris 11 NTP configuration file as described in this post, and simply dropped my working ntp.conf into /etc/inet/ directory. I then refresh and enable the NTP service, and confirm it is now running. My guess is the Solaris family of kernels do not like to be stuck inside virtual machines, and NTP's 500 PPM tolerance is regularly exceeded in Solaris virtual machines. Adding the following tinker panic 0 line at the top of /etc/inet/ntp.conf file may help, according to some online posts that I found. However, it does not solve the issue, and I am still looking for a resolution. I am not overly concerned because the logs seem to indicate these are notices (daemon.notice), not errors. Warning: Trying the advice on this Oracle blog post to modify /etc/system to attempt to increase "the system clock tick rate from the default of 100 per second to 1,000 per second, effectively changing the clock resolution from 10ms to 1ms" by adding set hires_tick=1 by itself, as well as followed by set hires_hz=10000 hang the Solaris boot-up process. Do not try these. I had fortunately taken a boot image backup using the beadm create command before trying these and failing, and was able to recover and will not attempt these changes in /etc/system ever again. 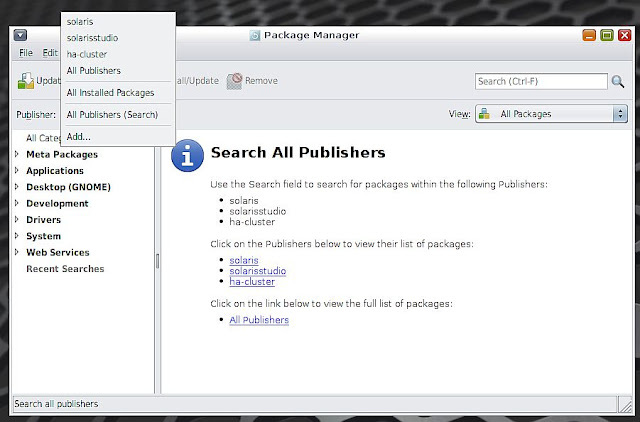 Launch the Package Manager and select "All Publishers" in the Publisher drop-down list. Then navigate to Meta Packages -> Group Packages on the left pane. Find the group package "developer-gnu" in the list of group packages on the right pane. Check the selection box at the left of that package, and click the Install/Update button at the top. That's it, when installation finishes, the familiar GNU C and C++ compilers and build tools will be available, along with Fortran and Objective C.
The default Solaris 11.3 VirtualBox image did not come pre-installed with a FTP server. I found FTP Server and Utilities" in the Package Manager and installed it. 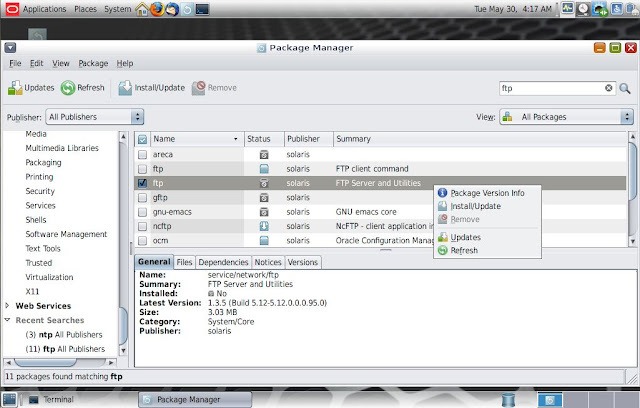 The FTP server installed is proftpd, which uses the main configuration file /etc/proftpd.conf. My goal was to deploy a simple anonymous FTP server with read-only access to clients. 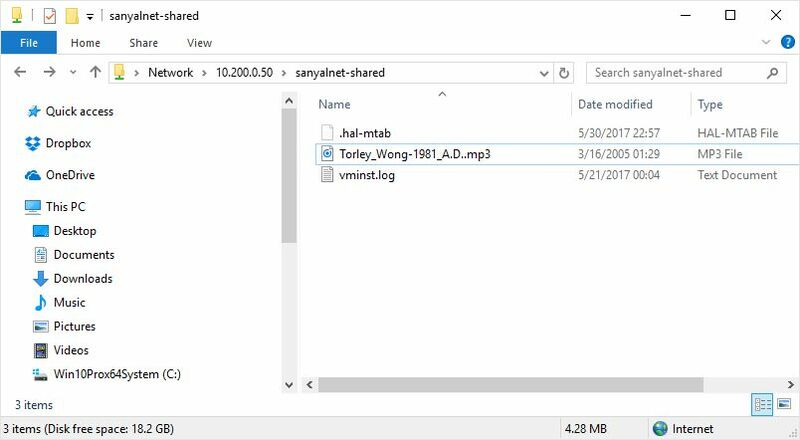 The basic onfiguration file made available here for establishing "a single server and a single anonymous login" fit the bill perfectly, more so as the Solaris package installer for FTP did create the required "ftp" account and the "nobody" account was already present. as seen in /etc/passwd. The problematic "DisplayFirstChdir" directive seems to enable display of a ".message" file in each newly chdired directory. I did not really care about this feature, and commented out the "DisplayFirstChdir" directive in the configuration file, and retried. Note: On Solaris 11, a service in maintenance needs to be taken out of maintenance by disabling and enabling it again after fixing the issues that put it into maintenance. Anonymous login to the proftpd FTP server now worked, but exposing all these directories to anonymous users is obviously not a good thing. The /etc/passwd file did specify / as the login directory for the "ftp" user. I changed the home directory of the "ftp" user to /media for now since I am not at the point of mounting devices at /media yet. Finally, I dropped a MP3 file from the internet archive into /media/ and retried anonymous FTP, and verified it works as expected. If you wish, you can additionally follow the instructions here to protect the FTP network service using TCP Wrappers module of ProFTPD (Solaris 11 hardening step). A primary purpose of my Solaris 11 installation is to be a shared network drive and file server for all the computers and devices in our home. Specifically, an external USB Hard Disk will be made available as a SMB/CIFS share across the network. No credentials will be required to access this share from any computer on the home subnets as long as the SMB client IP address is in the private address space. 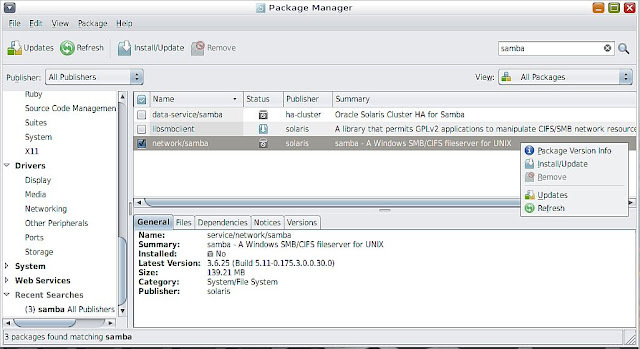 The network/samba package is not the same as service/filesystem/smb package. 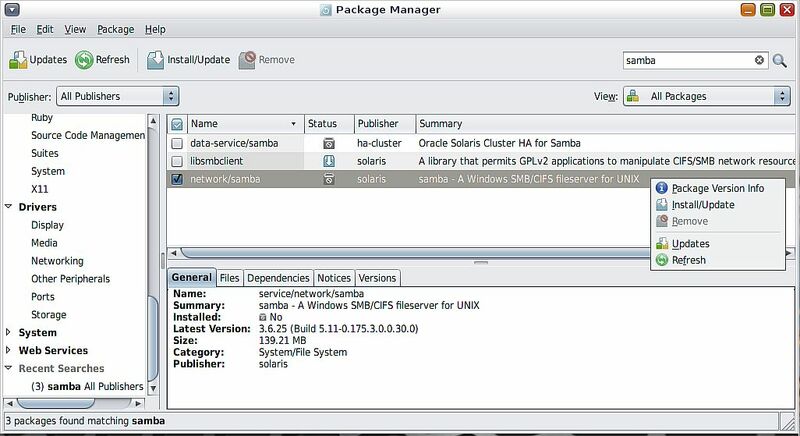 If you have the service/filesystem/smb package installed, you need to at least disable it using the svcadm disable command first before installing network/samba. Then I refreshed, started and verified the samba service. Finally, I successfully verified the shared drive is visible and I could transfer files from and to the shared drive from a Windows 10 workstation on the same network. I then simply put in my custom index.html and all associated files into /var/apache2/2.2/htdocs. Then I refreshed and enabled the http service and have a functional web server on Solaris 11. The access and error logs are written to /var/apache2/2.2/logs as configured in /etc/apache2/2.2/httpd.conf. This way, if the External Hard Disk mounting attempts result in a kernel that keeps panicking, you can choose a prior boot environment from the grub menu. In a nutshell, for an external USB drive to work seamlessly at USB 2.0 speeds with VirtualBox Solaris 11.3 virtual machine, we need to install the companion version of VirtualBox Guest Additions corresponding to the installed version of Oracle VirtualBox host software itself, on both the VirtualBox host software installation and the Solaris 11.3 virtual machine that runs under the VirtualBox virtualization environment. To get USB 2.0 transfer speeds from an external USB hard disk, I needed to upgrade the VirtualBox Guest Additions included in the Oracle Solaris 11.3 Oracle VirtualBox VM to the same version as my installed VirtualBox release on the host computer. I had already installed the extension pack on the VirtualBox host software right after installing VirtualBox itself by downloading and double-clicking "Oracle_VM_VirtualBox_Extension_Pack-5.1.22-115126.vbox-extpack" corresponding to the installed version of VirtualBox. VirtualBox pointer integration module unloaded. VirtualBox guest kernel module unloaded. Removal of <SUNWvboxguest> was successful. Once Solaris 11.3 returned after reboot, I used VirtualBox's "Devices" menu to select "Insert Guest Additions CD Image". As soon as I did this, the virtual Guest Additions CD was auto-mounted at /media/VBOXADDITIONS_5.1.22_115126 and new icon was added to the Desktop. I then installed the package VBoxSolarisAdditions.pkg from /media/VBOXADDITIONS_5.1.22_115126. 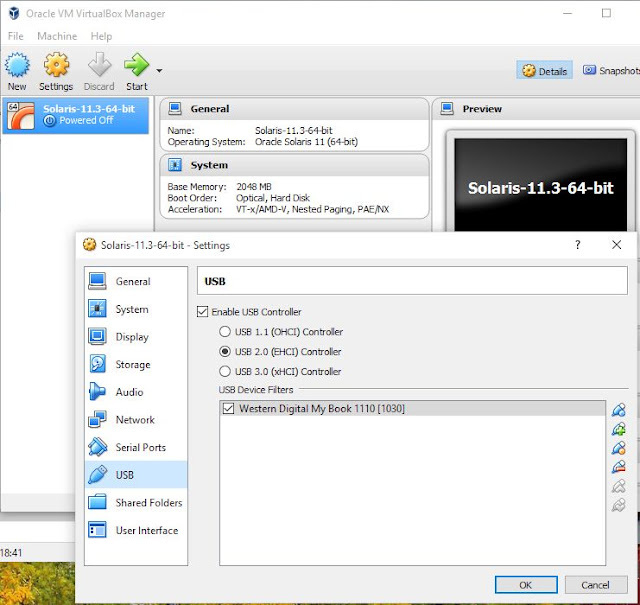 I shut Solaris 11.3 down from the desktop GUI and connected an NTFS-formatted Western Digital USB disk drive to a USB port on the VM host, reconfiguring the VM to connect the USB drive to Solaris 11 over USB 2.0. I then launched the Solaris 11.3 virtual machine, logged in and ran the Applications -> System Tools -> GParted Partition Editor tool. GParted took some time to scan the attached drives for partitions, after which I could select the external USB drive from a drop-down list at the top right corner. 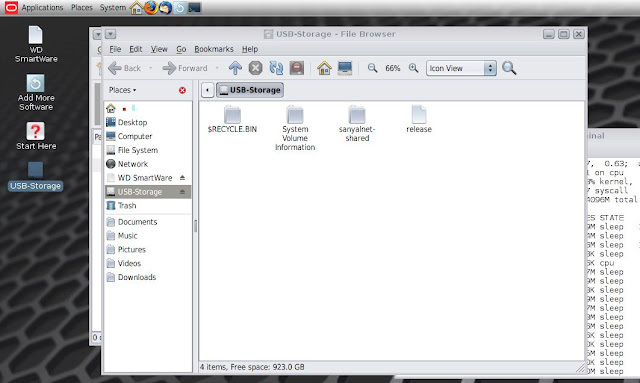 From the information presented, the device name for the USB drive is /dev/dsk/c3t0d0p1. Now that I know the name of the device corresponding to the Windows NTFS volume on the external USB hard disk, I proceeded to install the software tools needed to mount it on Solaris 11.3. The software needed to mount NTFS volumes on Solaris 11 are available for free from SFE - Software Packages for Solaris, OpenIndiana and OmniOS, To get access to the software, I launched the Package Manager from the desktop icon and first added the Solaris 11 IPS Packages Repository as a publisher using File -> Add Publisher... with the URI http://sfe.opencsw.org/localhosts11. 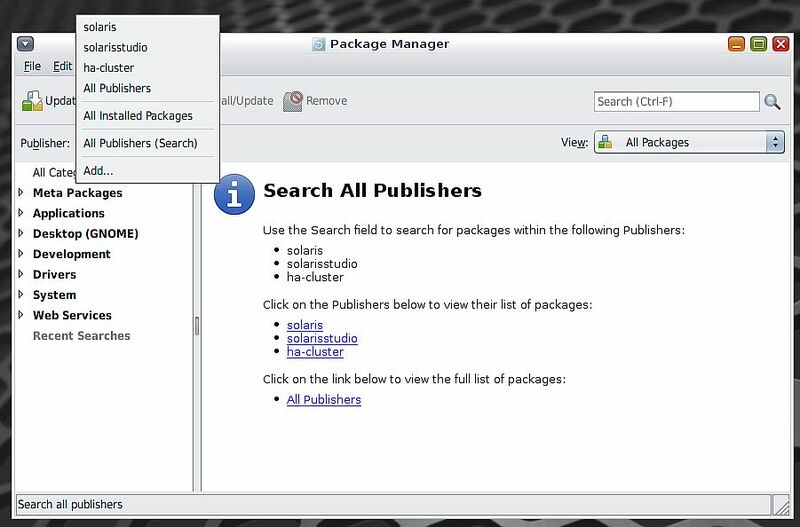 On clicking "Add", the Package Manager downloads, refreshes and caches the new catalog, and reports success in a pop-up window when all done. To install FUSE (File System in User Space), I searched for "fuse" in the Package Manager searchbox at the top right, checked the fusefs from publisher localhosts11 and library/libfuse from publisher solaris check-boxes, and clicked on "Install/Update". I then clicked Proceed on the Install Confirmation pop-up. After installing fusefs, I rebooted the system just to start clean since fusefs is a kernel module. Installing ntfs-3g turned out to be a bit tricky, and I had to build and install it from the source package. The problem with the ntfs-3g binary package is it includes the tools in the ntfsprogs package which was already installed in the Oracle Solaris 11.3 VirtualBox Virtual Machine distribution. Trying to uninstall ntfsprogs threw up dependencies on GParted and partition manager tools that I did not want to uninstall in turn because they are so useful. Building and installing ntfs-3g from source actually overwrites the ntfsprogs tools without requiring complex resolution of dependencies by uninstalling useful programs. 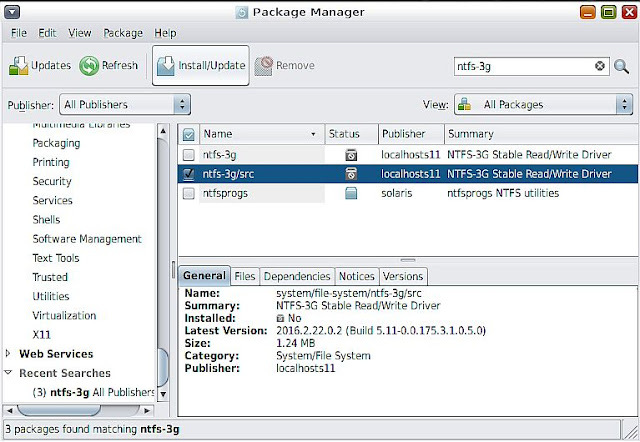 I installed the ntfs-3g/src source package from the SFE localhosts11 repository using the package manager. Here is a log of the complete terminal session of building ntfs-3g on Solaris from source and installing it. The "The disk contains an unclean file system (0, 0). The file system wasn't safely closed on Windows. Fixing." message typically happens during mounting a NTFS volume on Solaris 11.3 using lowntfs-3g or ntfs-3g if the volume was previously mounted on Windows and Windows was shut down in the "hybrid" fast-startup (fastboot) mode. A quick test to make sure we can write to and read from the NTFS volume, and we are all set on a read-write NTFS volume mounted on Solaris 11.3 using fuse and ntfs-3g. Then I rebooted and verified if the auto-mount on boot worked. Looks like everything worked and we are all set! I reconfigured Solaris 11 networking to the final production IP v4 address and gateway, based on excellent online documentation provided by Oracle including Creating Persistent (Static) Routes and Configuring IP Interfaces. I have no use for IPv6 which I did not configure. The completed reconfigured network configuration looks like this. and then grabbed action.d/blocklist_de.local from here. I then took help from my prior post about Fail2Ban on openindiana "Fail2Ban Intrusion Prevention on Solaris 11 OPENINDIANA SunOS 5.11 Illumos with Reporting to Blocklist.de" to configure it with full reporting capability to blocklist.de. I then reconfigured the ProFTP FTP server to use a folder on the external USB drive as ftproot. Finally I zeroed out the empty space on the ZFS file system and compacted the virtual machine hard drive, took a backup and put it into production at http://sanyal.duckdns.org:81.